Not rarely does it start to rain, when customers or business partners are in the way to a meeting. Without protection, the rain does not have to last very long, in order for them to be completely drenched. Suitable clothing but also a printed golf umbrella can change this problem effectively. The umbrella range of allbranded offers you attractive promotional products, among them, golf umbrellas. Available in various colours, you have the opportunity to print your message onto the promotional merchandise. We at allbranded will provide the equipment and the manpower. You can decide, how you would like your umbrella to be designed and allbranded will make your wish to their command. The UK is one of the rainier countries in Europe , as it is an island. This is not surprising. However did you know that although Manchester is known as the ‘rainy city’, it did not even make the top ten in 2015? The wettest city that year was Cardiff, making it to 115 cm of rain annually. Fun facts like those are known by smart promotional people, which is why they give umbrellas to co-workers and customers. Next to pocket umbrellas and cane umbrellas, golf umbrellas are very popular and are often used as promotional products at marketing campaigns. Not only VIPs and celebrities can look good with golf umbrellas on the golf court. Because of its big canopy, the printed golf umbrellas protect the owner from both the sun and rain. The light golf umbrellas also look very elegant and durable, which makes it perfect to withstand winds. 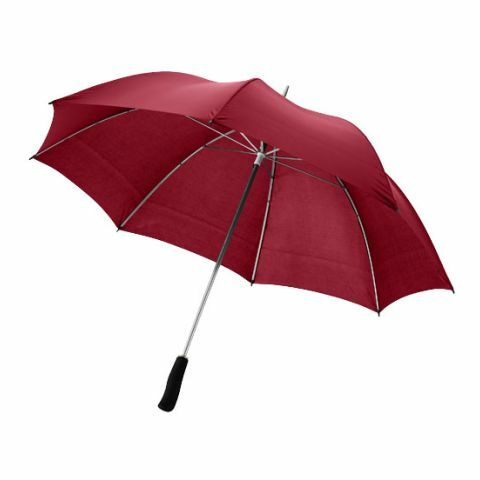 Available at allbranded, printed golf umbrellas can be purchased as either automatic umbrellas or manual umbrellas. Some versions are even constructed out of fibreglass. And of course, the colour range is huge. You can see: The golf umbrella is a very fashionable accessory with a high user value – and this makes it so interesting for advertising companies. Decorate your premium golf umbrella with your logo and make it to an irresistible eye-catcher. We will print this premium item according to your wishes. This way, your company logo will become an eye-catching marketing tool. If you would only like to advertise very subtly, then we recommend that you only print on one side of the canopy. 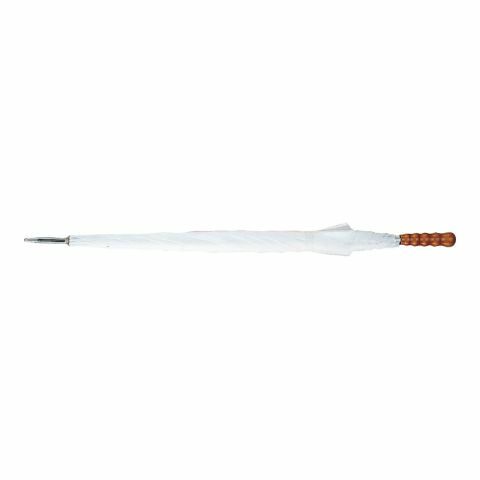 The personalised promotional umbrella is perfect for various target groups and occasions. Use It for example as a promotional gift for new customers. Connect with important existing customers. Show your employees that you value them. Hotel guests are going to be happy about this high class VIP treatment, as well as loyal collectors of airline points. 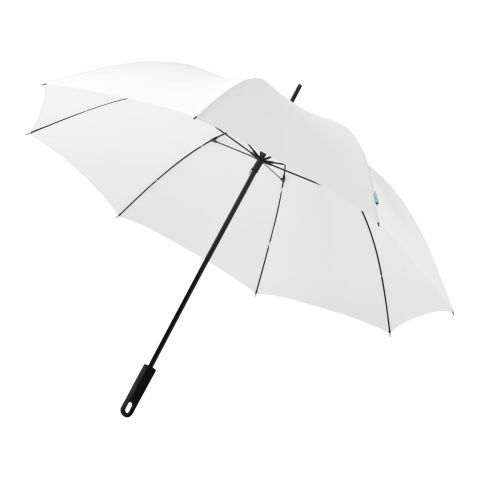 In the online shop of allbranded you can design your corporate printed umbrella according to your requirements. Step 1: Choose the type of umbrella from the different categories. Step 2: Design the golf umbrella according to your requirements and choose the quantity. Done. The price is going to be calculated automatically. Should you need support with this; a competent promotional expert will help you out in our live chat. We are going to be happy about your message. This is the service you can expect at allbranded.